A decadent dessert that is easy to make and perfect for Valentine's Day! For the crust, preheat the oven to 350F. In a medium bowl, whisk together almond flour, cocoa powder and erythritol. Stir in melted butter until it begins to clump together. Using your fingers, press firmly and evenly into a 9-inch tart pan or pie pan. Bake crust for 10 minutes. Let cool. For the mousse, puree raspberries, powdered erythritol and chambord together in a food processor. Beat whipping cream and LC-Sweet Drops with an electric mixture until stiff peaks form. Stir in sour cream until just combined. Fold in raspberry puree gently but thoroughly. 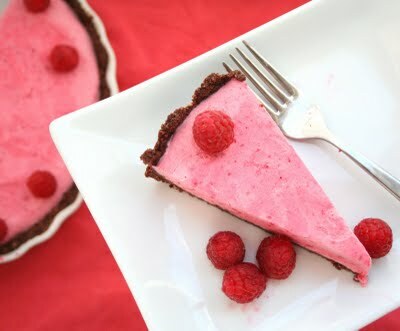 Spread raspberry mixture into cooled crust and freeze until set, at least 2 hours. 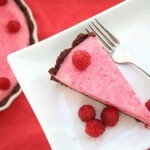 One to two hours prior to serving, put tart in refrigerator to thaw slightly. Each serving has 16.6g total carbs, and 2.5g of fiber, but only 8.6g if you subtract erythritol. Total net carbs equals 6.1g.